Feminist knowledge transfer and gender mainstreaming are deeply interrelated. Gender mainstreaming requires that institutional and organizational cultures undergo changes to include a gender perspective — based on gender knowledge — into all public policies and processes (Council of Europe, 1998). 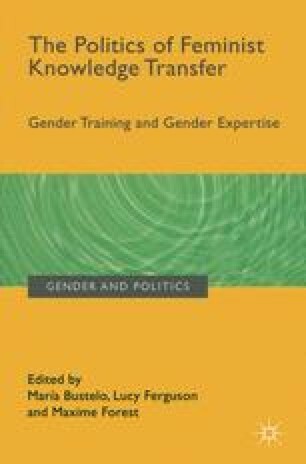 However, policymakers generally do not have sufficient gender awareness and competence to introduce a gender perspective into all policies, and they tend to work within institutional structures that are mostly gender-blind (Roggeband and Verloo, 2006). Gender training, taken here to mean training commissioned by public institutions and targeted at public administration personnel on how to mainstream gender into their work, is a key process of knowledge transfer (Pauly et al., 2009)1. Not all gender trainings are necessarily processes of feminist knowledge transfer, however. While “gender” knowledge transfer refers to gender as an analytical concept concerning the socially constructed relation between women and men, the “feminist” component of training includes a “goal”, a target for social change. This is of “challenging and changing women’s subordination to men” (Ferree, 2006, p. 6). In feminist, rather than only gender processes of knowledge transfer, change is not expected to come smoothly but rather involves conflict and contestation.